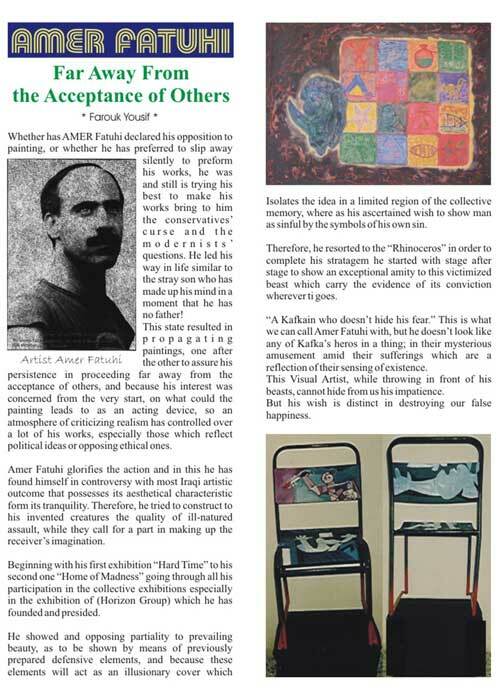 Whether has Amer Fatuhi declared his opposition to painting, or whether he has preferred to slip away silently to preform his works, he was and still is trying his best to make his works bring to him the conservatives’ curse and the modernists’ questions. He led his way in life similar to the stray son who has made up his mind in a moment that he has no father! This state resulted in propagating paintings, one after the other to assure his persistence in proceeding far away from the acceptance of others, and because his interest was concerned from the very start, on what could the painting leads to as an acting device, so an atmosphere of criticizing realism has controlled over a lot of his works, especially those which reflect political ideas or opposing ethical ones. Amer Fatuhi glorifies the action and in this he has found himself in controversy with most Iraqi artistic outcome that possesses its aesthetical characteristic form its tranquility. Therefore, he tried to construct to his invented creatures the quality of ill-natured assault, while they call for a part in making up the receiver’s imagination. Beginning with his first exhibition "Hard Time" to his second one "Home of Madness" going through all his participation in the collective exhibitions especially in the exhibition of (Horizon Group) which he has founded and presided. He showed and opposing partiality to prevailing beauty, as to be shown by means of previously prepared defensive elements, and because these elements will act as an illusionary cover which isolates the idea in a limited region of the collective memory, where as his ascertained wish to show man as sinful by the symbols of his own sin. 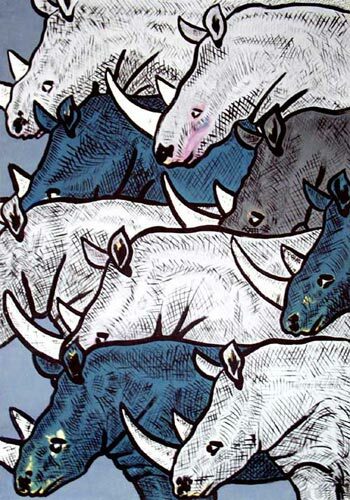 Therefore, he resorted to the "Rhinoceros" in order to complete his stratagem he started with stage after stage to show an exceptional amity to this victimized beast which carry the evidence of its conviction wherever it goes. "A Kafkain who doesn’t hide his fear". This is what we can call Amer Fatuhi with, but he doesn’t look like any of Kafka’s heros in a thing; in their mysterious amusement amid their sufferings which are a reflection of their sensing of existence. This Visual Artist, while throwing in front of us his beasts, cannot hide from us his impatience. But his wish is distinct in destroying our false happiness.